Restorz-it is a permanent finish that has been developed to be applied over any existing finish, eliminating the dreadful process of stripping and sanding. Refinishing your furniture and kitchen cabinets has never been easier; simply wipe Restorz-it on a clean surface with a soft cloth. Restorz-it is not a polish or oil that will dissipate; it is a unique blend of premium sealers that actually bond to your existing finish. 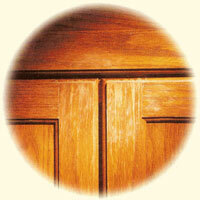 It seals and protects your wood, creating a very water and UV resistant finish that will last for many years. Restorz-it also contains color (stain) that will hide scratches, water damage, missing finish, and dull/faded areas See Color Guide. There is enough in one bottle to do an entire set of kitchen cabinets and 2 bathroom vanities (400 sq. ft.).